At this year’s Geriatrics for Juniors Conference we are running a poster competition for Audits and Quality Improvement Projects, done by junior doctors, that have improved the care of elderly people. 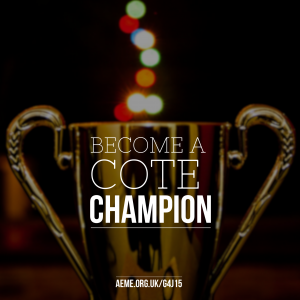 Successful authors will have their poster displayed at the conference, and the top projects will be names as our 2015 ‘CotE Champions’. The deadline for submission has now passed. Authors will be notified in early October regarding whether or not their poster has been accepted. Judging of the posters and prize-giving will take place on the day of the conference. We look forward to seeing all the great work you have been doing to improve the care for elderly patients.